In 2008, the Ugandan government imposed a ban on the use of polythene plastic bags. Sixteen year-old Andrew Mupuya perceived this as a great market opportunity to start a business of environmentally friendly paper bags. He named his company Youth Entrepreneurial Link Investment (YELI). At that time, his parents had become unemployed and the young secondary school student was struggling to find a way in which to help them financially and pay his school fees. The young entrepreneur recalls how it all started: “I made a business plan. To start out, I needed 36,000 Uganda shillings [About $13.4 at the current rate]. So I collected 70 kilograms of used mineral water bottles to raise capital. But I raised only 28,000/-UGs. [$10] My fellow students and teachers thought that I was mad. To meet up with the plan, I borrowed the remaining 8000/- [$2.9] from my teacher.’ I sold a ream of paper bags every 3 weeks and from each ream, I earned 20,000/-[$7.4] worth of profit. His company was the first Ugandan registered paper bag and envelope producing company and is currently employing more than 14 people. His main customers currently comprise local hospitals, retail shops and supermarkets. In discussing some of the challenges that he faced when starting his business, Andrew reveals that one of the greatest ones was negative peer influence. Almost everyone was expressing disbelief in Andrew’s capacity to succeed in his venture. Another significant challenge was the lack of understanding of the need to first improve the product’s quality and then focus on growing the market. He also had trouble with the suppliers of the paper, as he initially bought paper from a supplier in Kampala, until he decided to import it in Nairobi, where it was cheaper, even after the border taxes. Other key challenges were competing with a group from Kenya that was using machines, while Andrew’s workers were doing the work manually, as well as the problem of handling big orders in a limited production space. Despite all these obstacles, by 2012, Andrew’s company had managed to produce over half a million paper bags. In terms of his future goals, the young entrepreneur reveals that he plans to employ 60 people by 2015 and build a paper bag making plant which will result in a cleaner Africa, with its beautiful landscape free of the litter of plastic bags. He is also collaborating with the Uganda Research Institute to develop a way of recycling the materials that are usually left out in the paper bag production process. Apart from running his business, Andrew has also started training other 500 young people on how to make paper bags, which has led to the establishment of other 16 new project. With the profit obtained from YELI, Andrew has managed to pay his fees at the Makerere University, the salaries of his staff members as well as support his family, by opening up a bag distribution outlet for his mother to sell. 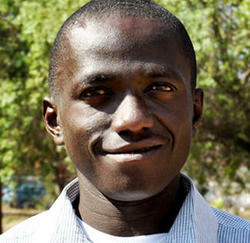 In recognition of his remarkable and innovative work, the young Ugandan has received a stream of awards. In 2011, he won the Business Plan Writing Competition among 300 other participants. He received an $1000 prize, which he used to buy furniture for his company. In 2012, he received the African Leadership Young Entrepreneurs Award, where he emerged as a winner among 270 participants and was granted $30,000 in bits to develop his business. He also won one of four 2013 Social Entrepreneurship Award in Europe. The other finalists came from the Norway, Sweden and the United States.